The Bureau of Reclamation is a federal agency within the Department of the Interior who operates water supply projects throughout the western 17 states, the largest of which is the Central Valley Project. Jeff Rieker is the Operations Manager for the Central Valley Project. 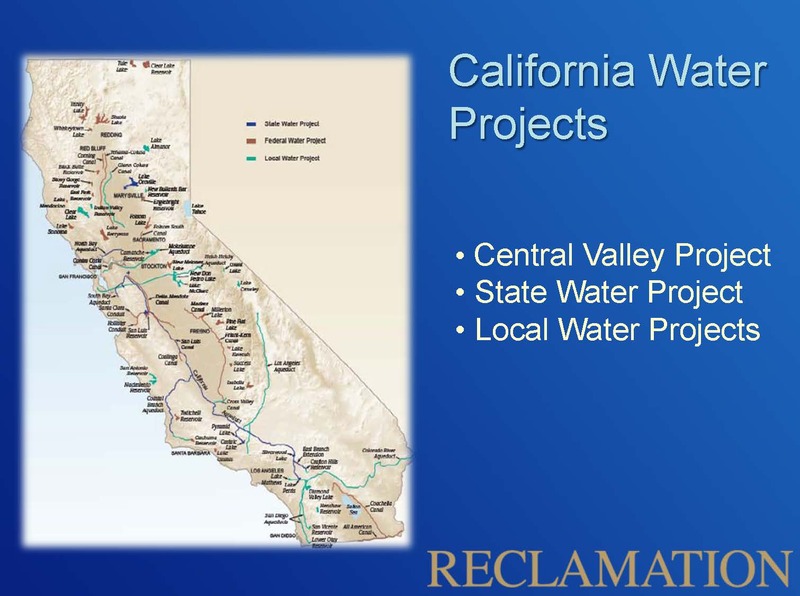 At the September meeting of the California Water Commission, he gave this presentation providing an overview of the project and its operations and how it integrates with other components of California’s water supply system. 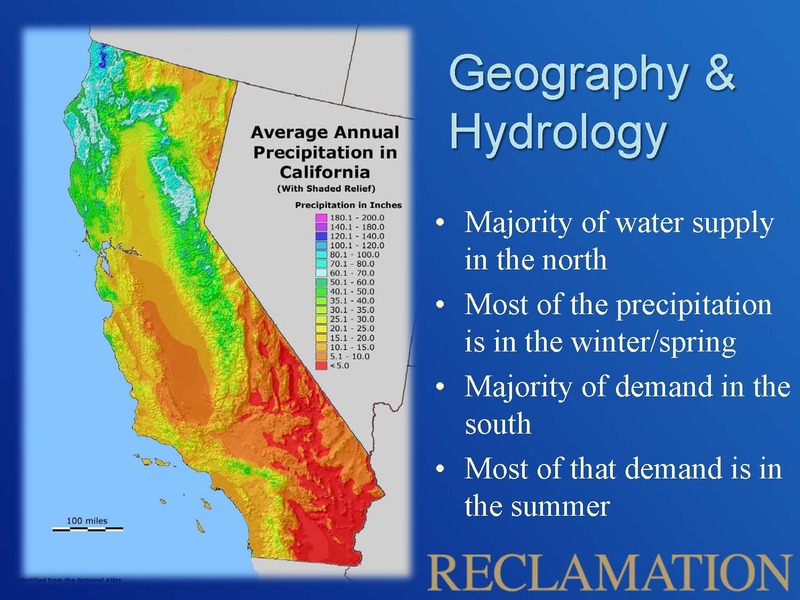 Mr. Rieker began by presenting a map showing the average annual precipitation for the state of California, noting that most of the water originates in the northern part of the state in the form of rain and snow during the winter and spring, while most of the demand is further south, both within the Central Valley as well as municipal and industrial purposes in Southern California, the majority of which is during the summer. 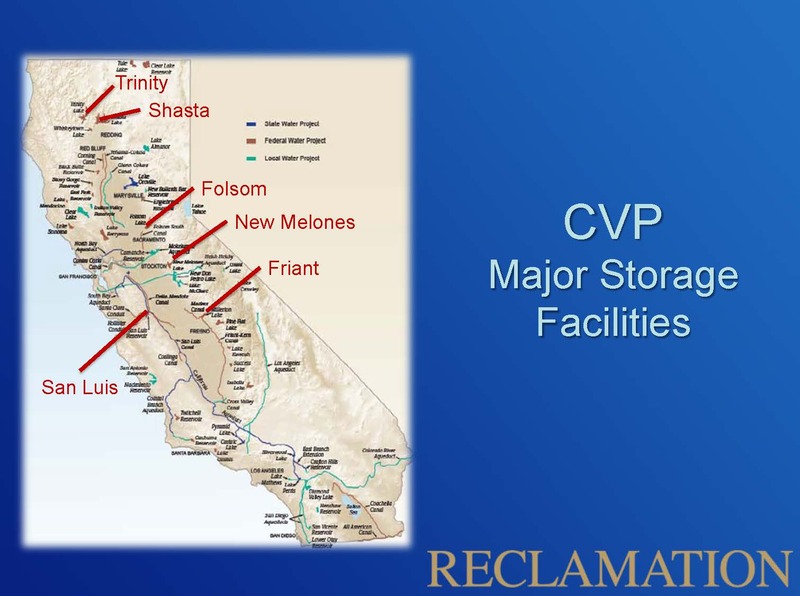 The basic concept of the Central Valley Project is that there are reservoirs to store water in the north, and that water is then conveyed it down to the Central Valley. When it came time to construct the state’s first large water supply project, it was during the Great Depression. At the time, Reclamation was in its heyday of building large supply projects throughout the West, so the federal government was brought in to construct the Central Valley Project. In later years, the state authorized the construction of the State Water Project. He noted that the Central Valley Project originally was focused mostly on agricultural water supply, while the State Water Project was focused a little more towards the municipal and industrial supplies. Several of the last phases of the Central Valley Project were actually constructed with DWR as facilities that would be jointly owned and operated between the two projects. The result is that today, there is a system throughout California that includes the Central Valley Project, the State Water Project, and a number of local water projects. 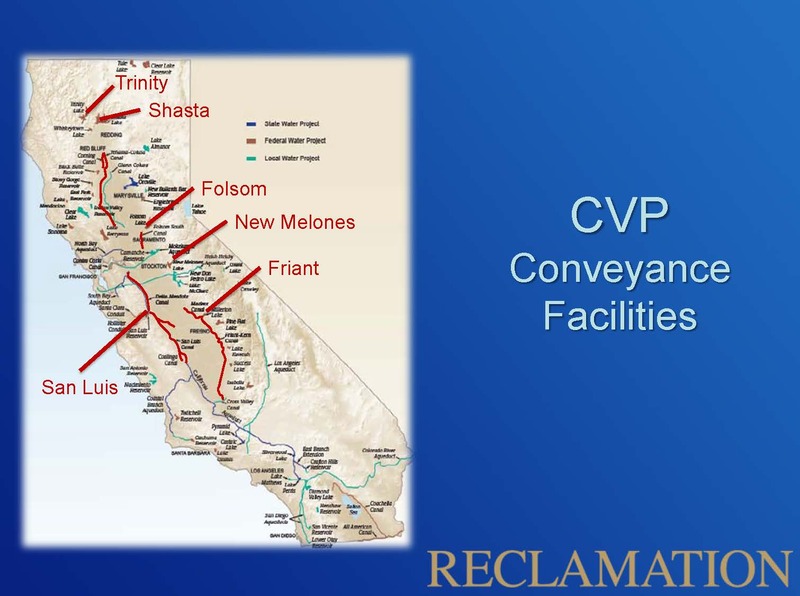 The main authorized purposes of the Central Valley Project are flood control, river regulation for navigation, municipal and agricultural water supplies, fish and wildlife purposes, power generation, and recreation. The Central Valley Project operates 20 dams and reservoirs, 500 miles of canals, 11 power plants, and 10 pumping plants. The project delivers 5 MAF on average to agricultural water users throughout the Central Valley, about 3 million acres of farmland, and provides about 600,000 acre-feet for municipal and industrial supplies, serving about 2 million people. 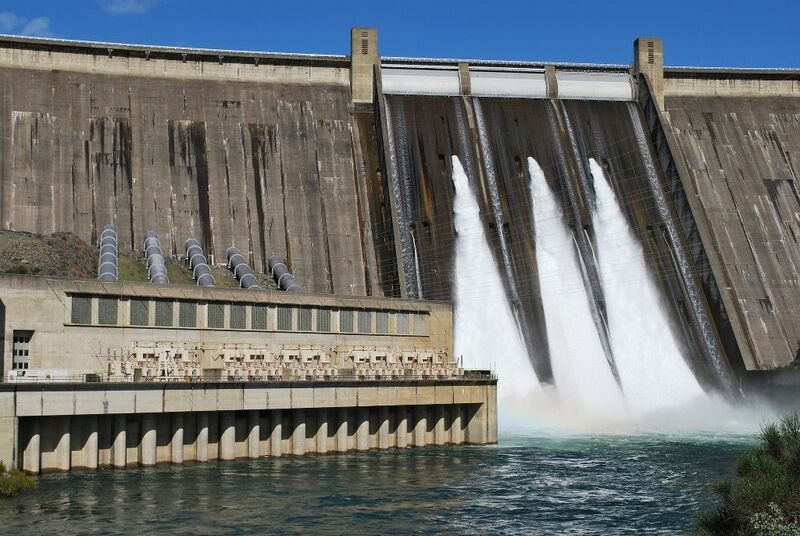 The Central Valley Project has 11 hydroplants that have 38 generators, producing 4.5 kilowatt hours per year. Mr. Rieker said that Central Valley Project is a net generator of power, using about a quarter of the generated power to run various pumping plants; the remainder is then marketed out through the Western Area Power Administration. The northernmost facilities are Trinity Dam and Reservoir which has 2.4 MAF of storage capacity. The dam is on the Trinity River which is a tributary to the Klamath River; water from that reservoir is then diverted through tunnels over to the Sacramento Basin and becomes part of the Central Valley Project supply. Then there is Shasta Reservoir on the Upper Sacramento River, which holds up to 4.5 MAF. Folsom Reservoir on the American River has about 1 MAF of capacity. Further south, New Melones Reservoir on the Stanislaus River has about 2.4 MAF of capacity. Down near Fresno, the Friant Dam impounds up to 520,000 AF of water. On the west side of the San Joaquin Valley is the San Luis Reservoir, a joint facility with the State Water Project; the reservoir has a capacity of about 2 MAF; of that, 977,000 AF is the federal share. The red lines on the map indicate the major conveyance facilities (or canal systems). The Corning Canal and the Tehama-Colusa Canal up to the north serve the Sacramento Valley. The Folsom South Canal is in Sacramento area, and further down south is the Madera Canal and Friant-Kern Canal which convey water from Friant. The Delta Mendota Canal exports water from the south Delta and there is the San Luis Canal south from San Luis Reservoir. Mr. Rieker then gave an overview of how the system is operated. Shasta Reservoir is the backbone of the Central Valley Project’s storage system; water is released out of Shasta into the Sacramento River. As it flows down the Sacramento River, they provide irrigation to a number of water rights holders that have rights that existed prior to the project through a series of contracts called the settlement contracts, as well as other agricultural users. That water ends up down in the Sacramento San Joaquin Bay Delta. On the American River, water is released out of Folsom to a variety of contractors, mostly municipal and industrial contractors in the Sacramento area. That water also ends up down in the Delta. That plus a combination of other inflows to the Delta provide the water for the Central Valley Project to pump at the Jones Pumping Facility in the south Delta. That water is conveyed south into the Delta Mendota Canal and serves a number of water users, eventually ending up back in the San Joaquin River down at an area known as the Mendota Pool. From there, they use Delta water to provide water to some of the previous senior water right holders along the San Joaquin River through a series of contracts known as the exchange contracts, because it was essentially an exchange of water from their original supply from the San Joaquin River over to a supply that is now delivered from the Delta. 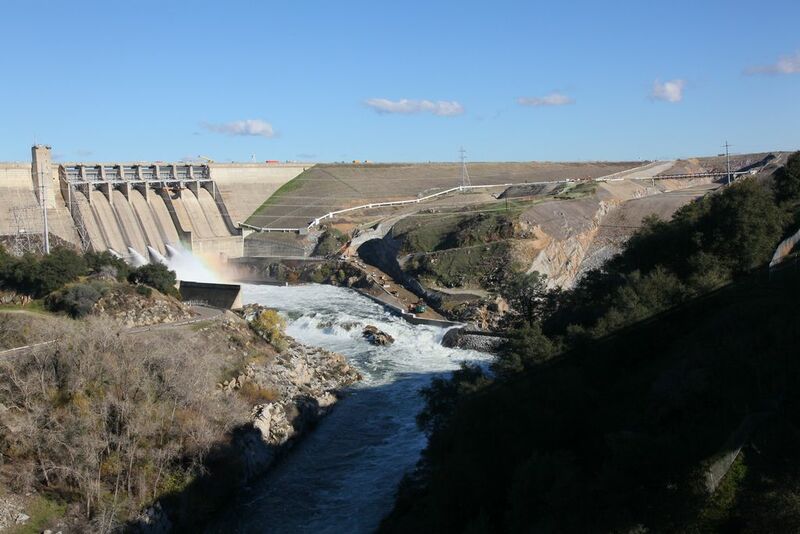 The exchange contracts made it possible for Reclamation to construct Friant Dam and utilize the San Joaquin River water to irrigate a large portion of the east side of the San Joaquin Valley known as the Friant Division. Later in construction of the Central Valley Project, Trinity Dam and Reservoir were built on the Trinity River. 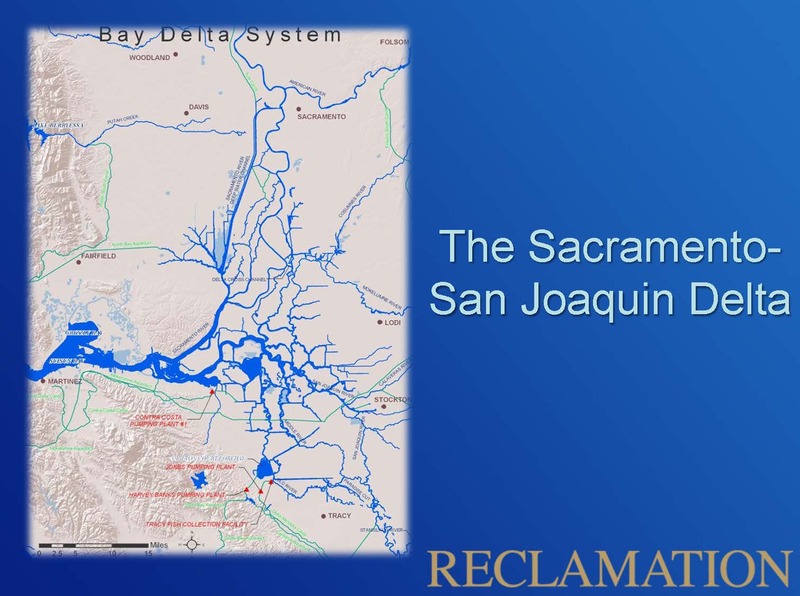 About half of that water is conveyed to the Sacramento River through a series of tunnels and re-regulating reservoirs and added to the project system; that added supply goes down to the Delta where it is added to the amount pumped, Mr. Rieker said. Later in the construction of the project, the San Luis Reservoir joint facilities was constructed with the Department of Water Resources; it’s essentially a pump up facility off the side of the Delta Mendota Canal and California Aqueduct. The facilities provide an opportunity to store water coming out of the Delta, and to provide water for the west side of the San Joaquin Valley where they provide for water supply contracts there. 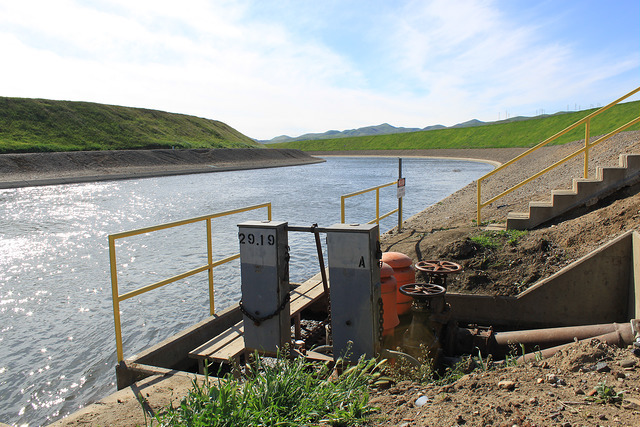 Finally, there is the New Melones Reservoir on the Stanislaus River which focuses on irrigation and other uses along the Stanislaus River for a number of districts there, as well as some of the instream requirements on the Stanislaus River. Some of the water does end up in the Delta as well and forms part of that Delta supply, he noted. Mr. Rieker then presented a map of the Delta, noting that water that flows in from the north from the Sacramento River and from the San Joaquin River to the south; originally, the water would naturally flow out to the San Francisco Bay. “Our pumping facility is down in the southern part of the Delta along with DWR’s, so that creates an opportunity to bring some of that water down from the Sacramento River across the Delta, but does create a bit of an unnatural flow system through the Delta, and that gives rise to a number of the regulations that govern the operation of the projects in order to protect the beneficial uses and ecosystem in the Delta there,” he said. In terms of regulations, one of the key operating elements is the Coordinated Operations Agreement, which is the agreement between Reclamation and DWR as to how the systems will be integrated, and provides for the accounting of the water supplies coming up out of the Delta. They also operate under the State Board decision known as D-1641, which protects the beneficial uses of the Delta. They have two biological opinions that they operate to, one issued by the federal Fish and Wildlife Service and one issued by the National Marine Fisheries Service; those are geared towards protection of the Delta smelt as well as a number of salmonid and other species. There are also several pieces of federal legislation, such as the Central Valley Project Improvement Act, the enabling legislation of the San Joaquin River Settlement, and the Water Infrastructure for the Nation Act, which was recently passed, among other various pieces of regulation. “All that is to say that we have a number of different elements that are guiding the operation of the project in addition to our water supply contracts and other requirement,” Mr. Rieker said. 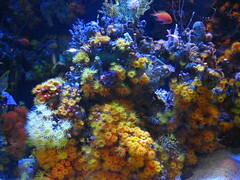 Operations are coordinated among a wide variety of players. The key coordination occurs between the Bureau of Reclamation and the Department of Water Resources on the integration between the two projects. Mr. Rieker said they work closely with the National Weather Service to ensure the best information about the hydrology as they manage their operations. Due to the regulations, they work with the State Water Resources Control Board as well as the two federal and the one state fishery agencies. During flood control and at other times, they operate in coordination with the US Army Corps of Engineers. Their power operations are closely coordinated with the Western Area Power Administration. And because all of these systems really tie together, they stay in close contact with both the local system operators as well as other stakeholders throughout the valleys. Commissioner Orth asked how the Water Infrastructure for the Nation Act affects the regulation and operation of the Central Valley Project. For the full agenda, meeting materials, and webcast, click here. For more information on the Central Valley Project, click here. For more on California’s water systems, click here.